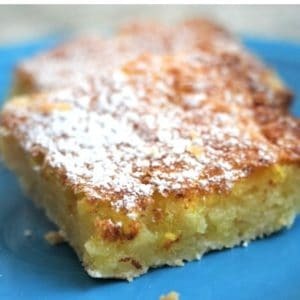 June 23, 2013 0 comments on "Old-Fashioned Lemon Bars"
Summertime makes me think of good old-fashioned lemon bars. I used to make them all the time when I was learning how to cook, but I haven’t made them in a long time. I decided to make up a batch for a family get together, and I had forgotten how easy they are to make. If you haven’t had them in a long time, it’s easy to forget how delicious they are! You can use either butter or margarine in this recipe, but butter is better! There is no comparison in the taste. Preheat oven to 350 degrees. Grease the bottom of a 13x9x2-inch baking dish. In a medium bowl, stir together the 2 cups of flour and powdered sugar. Stir in the melted butter or margarine. Press the flour mixture into the bottom of the greased baking dish. Bake the crust for 15 minutes, or until golden brown. Check it every minute or so towards the end to make sure it doesn’t get too brown. In a large bowl, beat the eggs until they are light in color and well blended. In another bowl, stir together the sugar, baking powder, and 1/4 c. flour. Stir the sugar mixture into the eggs. Stir in lemon juice. Pour the lemon mixture on top of the hot crust and return to the oven for an additional 30 minutes. Allow the bars to cool completely before cutting. Sprinkle additional powdered sugar on top, if desired. Like this recipe? You might also like my recipe for blackberry bars.